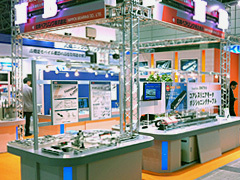 Exhibition Information | News | NIPPON BEARING CO., LTD.
Every year NB actively participates in a variety of machinery exhibitions across Japan. Please come and visit our booth to see our precision products of high renown. Organised by：News Digest Publishing Co., Ltd.
Due to your participation, the show has been successfully completed. Organised by：association tekkoukiden in Ishikawa.